Today I had the pleasure of speaking with Owen, an energetic four year old who LOVES the new "Dinosaur Island" exhibit at the Columbus Zoo and Aquarium that just hatched this week. 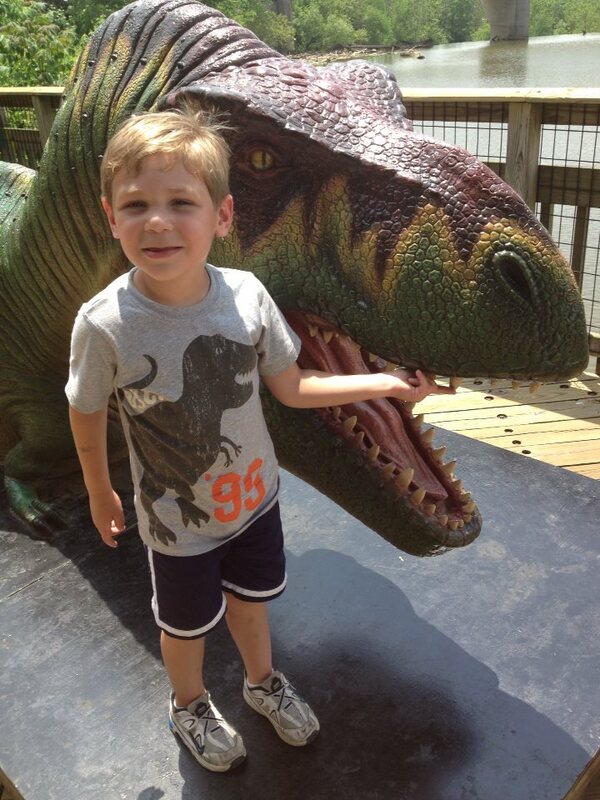 Owen loved the "Dinosaws" so much that his mom had to go through the exhibit twice in one day! Q: Owen, what did you see today? A: Dinosaws! Lots of them. Their wings went up and down and made noises. They had babies with eggs! The lady gave me pictures of all the dinosaws so I could see if they eat meat or leaves. The sand pit had cool, soft sand and bones in it, but i couldn&apos;t take them home. The long dinosaw was eating a tree, then the man buckled my seat belt, but I told him I can do it. He didn&apos;t want me to fall out of the boat. Q: What happened on the boat? A: We saw even more dinosaws and they squirted me a little, but mostly got mommy wet. And do you know what? A: I ate a big pretzel after! Q: Did you do anything else after? A: I climbed and slided then we saw penguins, elephants, lions, monkeys, pretty birds, a dark building.... then we went to see the dinosaws again! Owen&apos;s mom had a lot of great tips for seeing this fantastic new exhibit. They toured it first thing in the morning and there was no line. Stroller parking was easy as there was an area by the ticket booth as well as an area close to the boat ride if your little ones prefer to ride as long as possible. The attendants at the ride were great in making sure all the kids were buckled in safely and if you would enjoy staying a little dryer- sit on the right hand side. The dinosaurs were all throughout the ride on both sides and very easy to view. There was nothing scary for any age. The Columbus Zoo and Aquarium has many areas for picnicking- Owen and his mom found a shady spot by the Aquarium building. 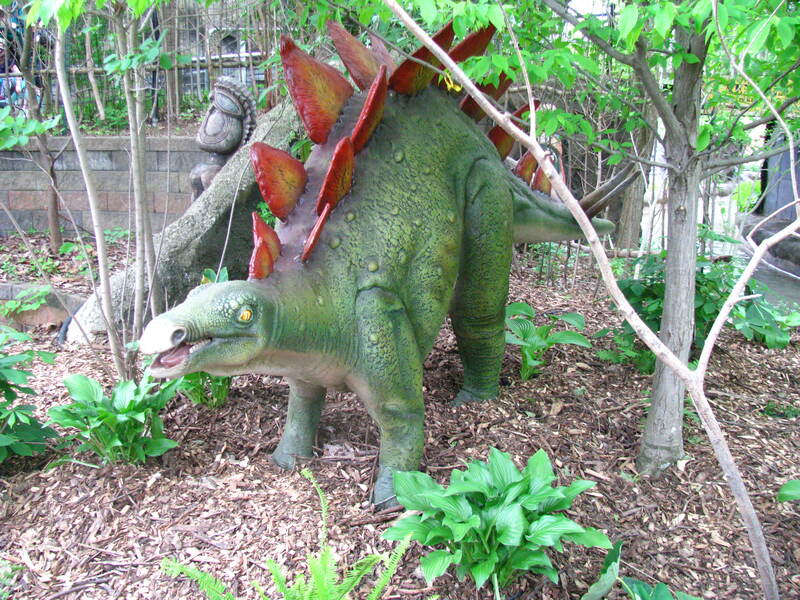 The Grange Insurance Stings, Wings N&apos; Playthings Park is very close to Dinosaur Island and a great place to rest while your kid enjoys the playground. When they returned mid-afternoon for round two of Dinosaur Island, there was about a ten minute wait for the ride itself, but you don&apos;t notice the line because you were enjoying a shady walk beside the river with lots of dinosaurs at every turn. The waiting area by the boats also has a shaded cover and moves quickly. The "Zoo-it-All" wristbands are available at the front gate for $9.99 and include unlimited entry into Dinosaur Island, the Carousel, Bob Evans Express Train Ride and Jungle Jack&apos;s Landing. They do not include entry to the zoo. If you are planning a trip to the Zoo this summer, check out the Columbus Zoo/COSI Family Getaway Package that includes discounted tickets to the Zoo, Zoombezi Bay and COSI!